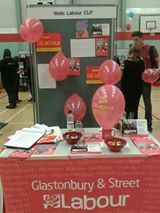 There was a Fantastic response from the young people of Somerset at our Labour stall at Strode College Fresher’s Fair this autumn. Lots of enquiries, some joining there and then and lots of members new and old coming to say hello. In addition the politics tutor told us that there is an upsurge in interest in politics among students with, for the first time, them having to put on two groups for the A level classes. He attributed this to the ‘Corbyn effect’ which has engaged the interest of the youth vote. We say thank you to all the members who came along on the day and to Tatiana for arranging the stall.